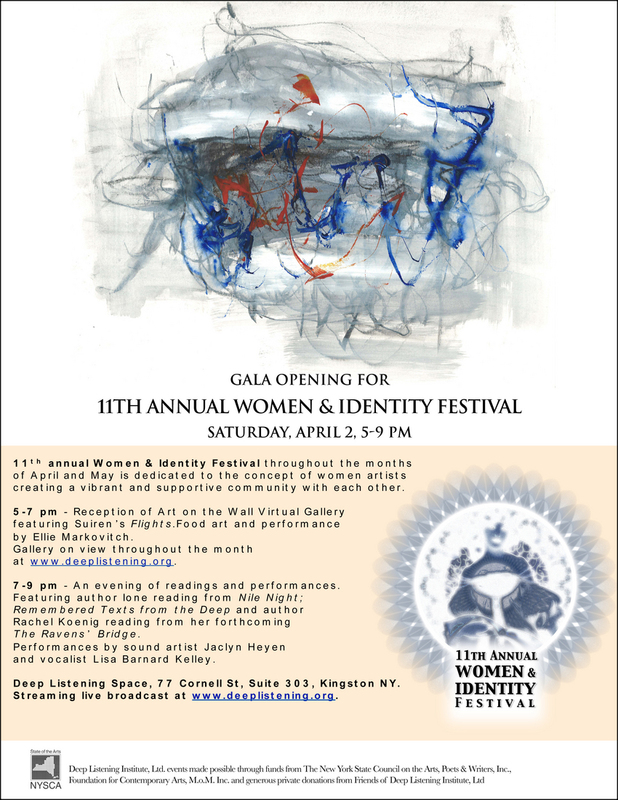 11th annual Women & Identity Festival throughout the months of April and May is dedicated to the concept of women artists creating a vibrant and supportive community with each other. 5-7 pm – Reception of Art on the Wall Virtual Gallery featuring Suiren’s Flights. Food art and performance by Ellie Markovitch. Gallery on view throughout the month at http://www.deeplistening.org. 7-9 pm – An evening of readings and performances. Featuring author Ione reading from Nile Night; Remembered Texts from the Deep and author Rachel Koenig reading from her forthcoming The Ravens’ Bridge. Performances by sound artist Jaclyn Heyen and vocalist Lisa Barnard Kelley. LOCATION: Deep Listening Space, 77 Cornell St, Suite 303, Kingston NY.